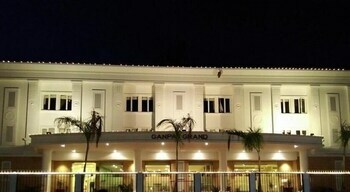 When you stay at GANPAT GRAND in Palani, you'll be 6.7 mi (10.8 km) from Palar Dam. Featured amenities include a 24-hour front desk, luggage storage, and laundry facilities. Free self parking is available onsite. With a stay at Vista Rooms at Amar Sagar Gate in Jaisalmer, you'll be within a 10-minute walk of Nathmalji-ki-Haveli and Bhatia Market.